In 2014 Easter Saturday falls on 19th April, with Sunday 20th being our alternate. Rules below are last year’s and will be updated in Mid March 2014 – please check back for updated rules, and check the rules you get on the day. with your skipper’s name as reference, and “contest” as the code. If you leave your entry to the day, then we can only take cash or cheque. Please complete and Email entry form to us. All decisions of the organising committee are final all matters. Fishing will commence 7.00am on Saturday & end at 3.45pm (or may be extended to Sunday if weather unsuitable). Weigh in will be from 2.30pm to 4.30pm. Competition must run for at least 2 hours to be deemed a competition. Fishing will be with rods and reels. No Kontikis, kites, nets, spear guns or long lines are permitted. Fishing is permitted in an area from Oraro Spy Glass due East (true) to sea to the Hapuku river mouth due East (true) out to sea. Cheating results in disqualification. Before you begin fishing make sure that you are clear on all the rules. Channel VHF 60 [International] is the official radio call station. All fishing prize winners are determined by measured weight and tournament organizers have final decision. If two or more fish of equal weight become eligible for any prize then a draw will determine the winner. All winners must be on hand at prize giving. If not present then prize will be redrawn. Charter Boats entries are permitted only within their own category and prize pool. Entries will be capped so first in. Any fish may only be entered in one category. In the event of bad weather it will be held on the Sunday. All boats must leave a completed information form with organizers prior to fishing. NO NUMBER ISSUED – NO FISHING. All boats must carry a lifejacket for each crew member on board and a safety check will be carried out with a prize draw for safe vessels (the more safety features the more entries –judges decisions are final). Vessels under 6m lifejackets must be worn. No vessels over 8m (stem to stern length) are permitted on the Club’s South Bay ramp. 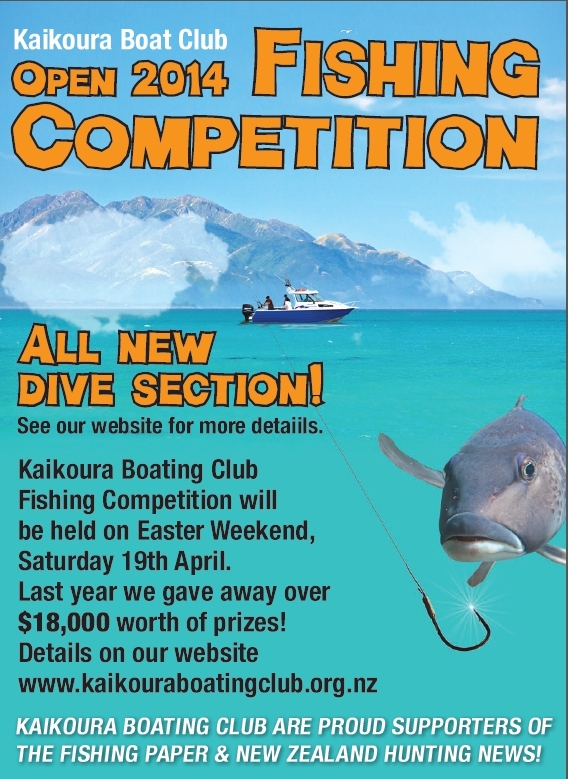 Boats over 8m entered in the competition may use public ramp (free of charge). If you have any queries regarding regulation please contact your local MFish Fisheries Officer. All fish must be of legal size and each angler is must abide by the MFish Fisheries regulations. To ensure they only take the vessel out in conditions that are appropriate to both the type of vessel and your own skill level. Safety of vessel and crew are the responsibility of the skipper. Skipper must report in when landing. Weigh in will be by the South Bay Boat Club Ramp. Environment Canterbury sponsored Safe Boating prize – Waterproof hand held radio.